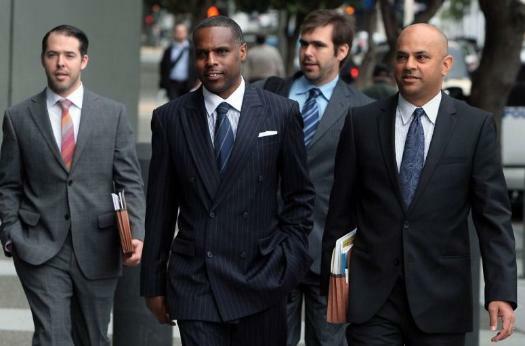 Keith Jackson, a former member of the San Francisco Board of Education who became a political fundraiser and fixer, is set to be sentenced Wednesday, February 24, after pleading guilty in federal court to being part of a racketeering conspiracy. Federal prosecutors are asking for a 10-year prison sentence. Former State Senator Leland Yee, one of Jackson’s crime partners, is to be sentenced Wednesday as well. Jackson is also facing additional bribery and money laundering charges as part of an investigation by District Attorney George Gascón. This is not a pretty picture. It indelibly stains San Francisco politics with the aura of “pay-to-play” corruption. Jackson’s attorneys in his federal court case are requesting mercy based on his history as a dedicated activist with over two decades of community involvement.” Oh yeah. Jackson got his start in San Francisco politics when he was elected to the School Board in 1994. He was only 30 years old. During his campaign, Jackson had pledged to get rid of the Junior Reserve Officer Training Corps (JROTC) in San Francisco schools. JROTC was in the crosshairs in 1994 when a scandal erupted after several students were hurt during a JROTC hazing at Balboa High School. The Balboa incident only highlighted the belief among many that JROTC is primarily a military recruitment program that encourages a culture of militarism and violence, and has no place in our schools. Jackson, who bragged about being an army veteran, was no stranger to this culture. In 1995, Board Member Dan Kelly introduced a resolution to end the JROTC program. Kelly had served time in federal prison during the Vietnam War as a draft resister. His resolution appeared to have the four votes necessary to pass, with the support of school board members Tom Ammiano, Steve Phillips and Jackson. But at a dramatic school board meeting, Jackson folded. The meeting was packed with JROTC students, ironically chanting the anti-war mantra “Hell No, We Won’t Go!” When it came time for the vote, Jackson switched sides. Kelly’s resolution lost by a 4-3 vote. Jackson provided the swing vote that saved JROTC. Ironically, the pro-JROTC school board majority included Jackson’s future partner-in-crime Leland Yee. Years later, after Jackson was indicted, Brown told the media that he was “shocked” by the charges against him. JROTC, of course, is still well ensconced in our schools, despite ongoing political battles and controversies, and despite the downfall of supporters Yee and Jackson. And that is one of Keith Jackson’s legacies, in addition to his shattered reputation as a “dedicated activist” turned bribester. U.S. District Judge Charles Breyer sentenced Jackson to nine years. Breyer called Jackson a "one-person crime wave."